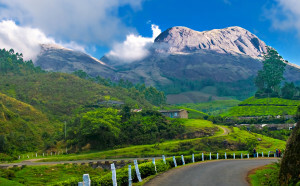 Arrive Cochin pickup & Proceed for Munnar approx. 110 kms. on the way sightseeing of Waterfall, On arrival check in at the hotel. Overnight at the hotel. Today proceed to cochin airport to board the flight to next destination or your hometown with lots of memories to cherish for a life time! Breakfast in Munnar thekady, & only Houseboat stay with all meal. After Breakfast Proceed for the green hills of Munnar. approx. 110 kms. on the way sightseeing of Waterfall, On arrival check in at the hotel. Overnight at the hotel. Today after breakfast check out from the houseboat, proceed to Kovalam approx. 138 Kms, famous for its beaches. Kovalam consists of three adjacent crescent beaches. The Southernmost, known as the Lighthouse beach. On arrival check into hotel, rest of the day is at leisure. Overnight stay in Kovalam. After Breakfast Excursion to Kanyakumari approx. 90 Kms, the southern Tip of Indian sub-continent. Visit the Vivekanand Rock Memorial, take boat ferry to reach to memorial. Ten visit Gandhi Mandapam and Wax Museum. Drive back to your hotel in for overnight stay. Breakfast in Munnar Cochin Kovalam, & only Houseboat stay with all meal.